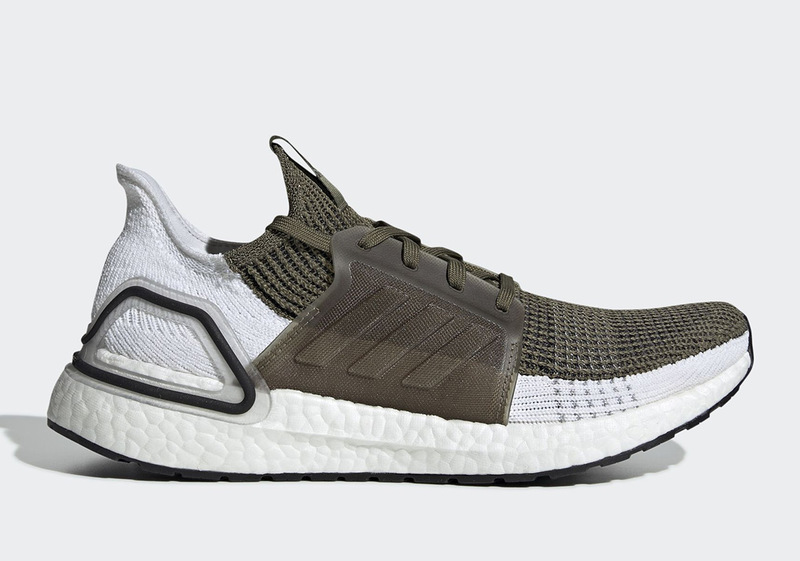 Home>Sneakers> Adidas UltraBoost 2019 Gets Dressed In "Raw Khaki"
The Adidas UltraBoost has widely been considered one of the greatest running shoes of all time thanks to its simple primeknit design and Boost midsole. The original UB's are a thing of legend and over the years, Adidas has cranked out a plethora of colorways of the sneaker for consumers to enjoy. The silhouette of the UltraBoost has always remained the same until this year when Adidas decided to take a risk and change things up. With 20% more boost than previous models, Adidas feels like they have a huge improvement on their hands. There has been a whole slew of UltraBoost 2019 models so far but in true Adidas form, the brand is adding yet another colorway into the mix with this new "Raw Khaki" version. The lower half of the primknit is white, while the top half, including the laces, comes in a dark green khaki color. As most regular version of the UltraBoost do, the Boost midsole is white. For those who are looking to cop this latest model, it will be dropping on April 1st for the standard price of $180 USD. SNEAKERS Adidas UltraBoost 2019 Gets Dressed In "Raw Khaki"